ICR Electric, Inc. has a complete range of capabilities: service upgrades, machine wiring, rehab, temporary setups, new construction, industrial maintenance, and troubleshooting. Guaranteed work conforms to National Electrical Code. Complete Quote in Proposal form that includes: Cost Evaluation, Specific Electrical Needs, and Terms of Payment. Electrical Service designed to Individual Requirements. All Engineering and Installation for a Complete Operation. At ICR Electric, Inc., we aim to provide our valued customers with the highest quality craftsmanship and service in fuse to breaker changes and audio visual wiring. We pride ourselves in our exceptional experience and diversity and also offer fully trained journeyman electricians and up-front, straight forward pricing. 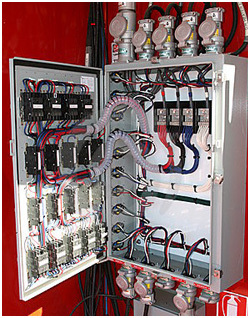 Electrical Wiring or Panel Upgrade - Featured! We start all our electrical jobs with your satisfaction in mind. When you hire ICR Electric, Inc. as your Electrical Contractor, you can be confident that you will get the best electrical service in Akron, OH. Our trained staff brings you more than superior electrical service, they bring you piece of mind knowing that your family or business stay in good hands.